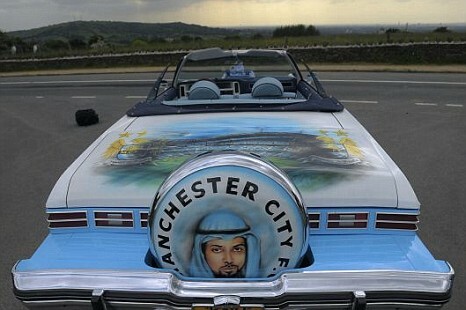 This here tastefully ‘pimped’ automobile belongs to a pair of City fans by the names of Shaun and Mike, who have spunked £50,000 on turning their imported ’75 Chevrolet convertible into the ‘ultimate Blues-mobile’. 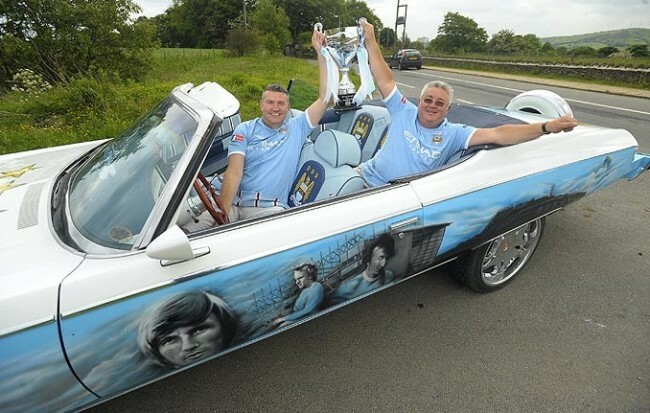 The pair bought the car in North Carolina for £15,000 then spent a further £5,000 shipping it back to England, before fluffing a further £30,000 having Franny Lee, Mick Summerbee and Colin Bell’s legendary mugs airbrushed down one side, Carlos Tevez (uh-oh), David Silva and Nigel De Jong down the other, sky blue upholstery stitched in throughout, Eastlands daubed on the boot lid, a whopping great City crest on the bonnet and a fantastically gaudy Sheik Mansour decal slapped on the spare wheel cover. 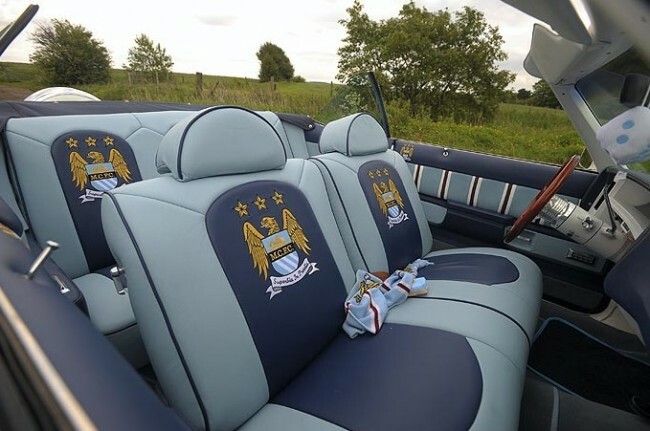 “Shaun wanted a big and brash car to go to matches in. We found this one but then it snowballed. 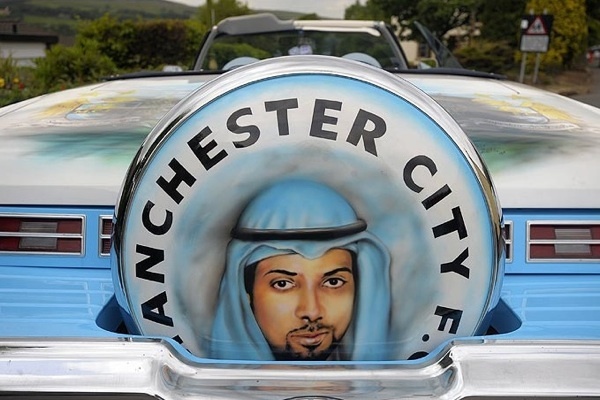 “We had to tell Tom Jones, a United fan from Oldham who has done art work on cars for us before, ‘don’t you dare put a Red Devil on it’. “When it was finished we went over it with a fine tooth comb to make sure they hadn’t hidden any United stuff in it. What do we reckon folks? Money well spent? 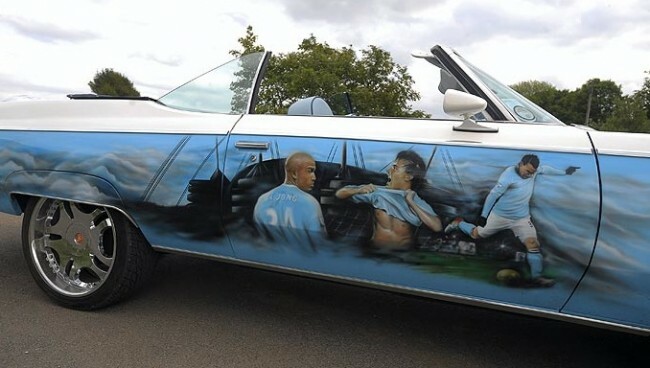 you can absolutely tell it was painted by a united fan, ahahahahahaha. I vomitted in my mouth. 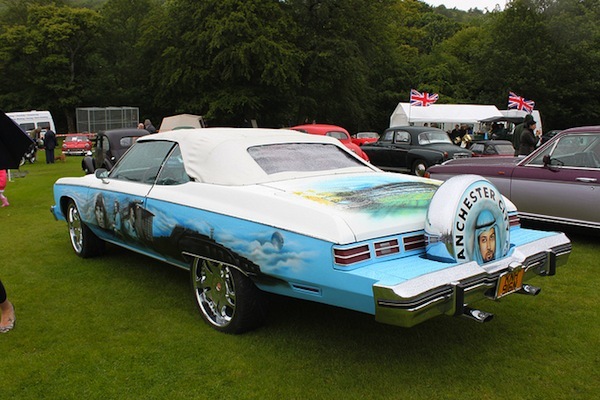 The interiors pretty smart, but the outer paintwork is tacky as hell. As classy as the team!!! What kind of 2@ would even consider driving that thing? Absolutely Chavrolet!! !